He looked like my baby boy when I tucked him into bed last night. 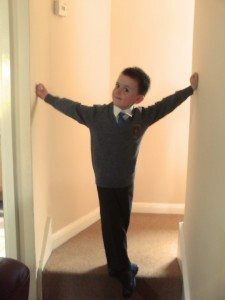 The little cheeky man off to primary school. and a faint whiff of teenager. Instead a handsome young man, taller than me. With a bag full of the latest kit, a bus pass and a mobile phone. If you know what to look for. – a bit too loud, a bit too jolly, a bit too much teen slang. Not in front of his new friends. And the house is empty. A bit later than before, a bit louder, a bit more exhausted. We dropped ours off this morning too. We didn’t bike as planned, but drove her in and walked her to the gates. And she tried to walk off without a kiss, but I wasn’t having it… I’ve cried all morning, which is most unlike me. Great blog , rings so true. 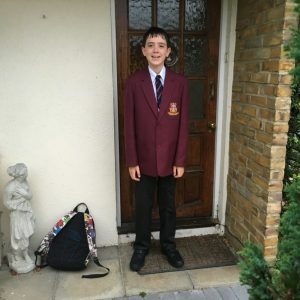 The first day of secondary school for my eldest were some of the longest days of my life, were they ok?, had they made friends? did they find the classroom etc etc. Both were absolutely fine but it was so hard to let go…. Only two more to go Karen… Somehow, when the littlest one goes it seems even harder. i guess I am used to seeing him as the baby but he is really not…..